Are you struggling with writing tweets that get clicks back to your content? It can be a challenge – trust me, I know. But driving traffic is often the number one goal of businesses using Twitter for business, and rightly so. After all, Twitter is designed for people who are looking for information. In fact, Twitter’s CMO, Leslie Berland, recently put it best in a speech at CES 2017 in an attempt to demystify the purpose of the platform. She said, “Twitter is the place to see what’s happening.” Hell, it’s even right there when you go to compose a tweet! Unlike other social media platforms, Twitter’s main purpose and benefit is not to connect online with people you already know. On those other platforms (think Facebook, Instagram, SnapChat), most messages from businesses are an interruption to the social experience. Not so on Twitter – not at all. Again, people come with the intent of searching Twitter for information. You need to be the one to provide it to them. And in order to effectively introduce people to your content, tweets basically become interchangeable with headlines. So how do you write tweets (headlines) that get clicked? 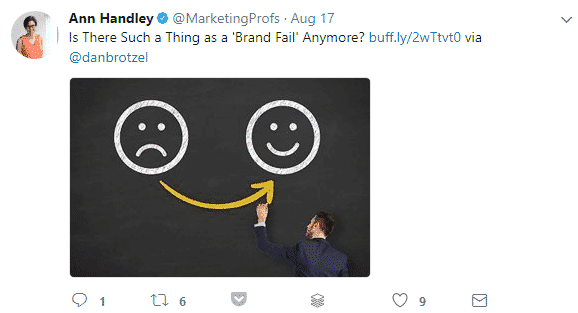 In this post, we’ll take a look at seven proven headline writing techniques and some examples of how those translate into tweets that drive traffic. After each example, I’m providing a “fictional reader reaction” (basically what went through my mind when I first saw each of the tweets). And, fun fact, it took me a record time to research this post – I read every one of the articles the tweets link to (except the Disney one – I didn’t download the Bambi wallpaper, I swear). Obviously, this stuff really works! If you want people to click through to your content, let them know exactly what to expect. Twitter is a fire hose of information coming at you at all times. People need to know what they’re clicking through to is of interest to them. 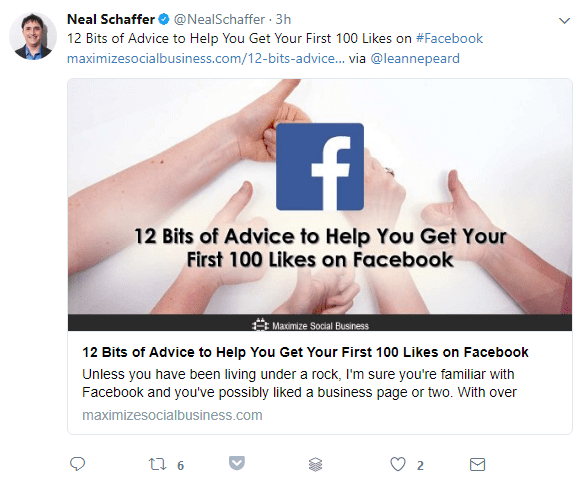 Check out this tweet from Neal Schaffer: tells you exactly what to expect. And it targets exactly the right audience. Fictional reader reaction: “I’m new to Facebook and need all the help I can get. A hundred page likes would be awesome. Let’s see what Neal’s advice is!” Click. And when you click on that link, you’re going to get exactly what you expect. Trust me, that matters…a lot. People move fast online – and on Twitter, they’re going at warp speed. If you don’t set the right expectations and send people to an irrelevant post, they hit the back button so fast it will make your head spin. If you do this, the best case is you’ve missed an opportunity for someone to read your post. Worst case? You’ve destroyed your credibility and will never get any more clicks from that particular Tweep. Also, if you send people to an irrelevant page and they back out immediately, Google knows about it. Bounce rate and a minimal time on page are ranking signals. Those things tell search engines your content is not perceived as valuable and could end up dinging your SEO. One of the best ways to be ultra-specific in your tweets is to use numbers. Think about it this way: would you be more likely to click on a headline that reads, “Learn to make more money,” or one that reads “Learn how to make $200 in the next 8 hours.”? Of course the second one, right? It tells you how much money you can make and in exactly what timeframe. In addition, a headline like that instills confidence that there are specific, actionable steps that will show you exactly how to do it. Also, use the actual number instead of spelling it out. Numbers stand out when you use the numeral instead of the word. And, bonus, they take up fewer characters in a tweet. Fictional reader reaction: “I love easy hacks. I definitely want 3x more email subscribers. And I can get them in just a month by doing the same thing Neil did? !” Click. After all, who wouldn’t want to achieve those results? Curiosity is a powerful motivator of human behavior. In fact, studies show that people are hardwired to satisfy their curiosity – so much so that they’ll do so even when it’s potentially hazardous. Tap into that desire to satisfy curiosity with your tweets. At first glance, this seems at odds with my first tip about being ultra-specific. After all, how can you create curiosity and be ultra-specific simultaneously? Fair question…and it’s not easy, especially with the limited characters of a tweet. But it certainly can be done. Be ultra-specific about the problem, but leave room for curiosity with the solution. 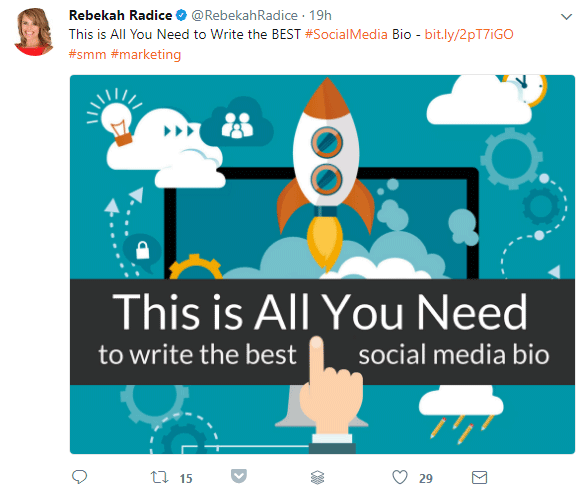 The following tweet from Rebekah Radice is a perfect example of being specific and creating curiosity at the same time. Asking questions in headlines (and tweets) is a powerful technique. People logically follow through with the answer – or at least what they perceive to be the answer. Any time you get someone’s attention and start them thinking, you’re halfway to the click. Sometimes, the answer may seem obvious, but just the fact that the question was asked provides just enough doubt to get that click. Questions in tweets go hand-in-hand with creating curiosity. Fictional reader reaction: “Yes, of course, there are brand fails – I just saw on yesterday. But wait, why is she asking this? Are there really still brand fails? Let me see what this is all about.” Click. The words you use in tweets matter. You’ve only got a few seconds to catch and keep their attention and boring copy just won’t cut it. You need to use POWER WORDS for effective tweets! Don’t teach people how to do something – teach them to crush it. Instead of giving people 7 ways to do something, give them 7 mind-blowing ways to do it quickly and easily. Hubspot gets it. Check out their tweet about Tim Ferriss’ email system that boosts productivity. It’s not just an email system – it’s a genius system. And it doesn’t just boost productivity – it leads to maximum productivity. Fictional reader reaction: “I want maximum productivity like Tim Ferris. And I’m no genius, but clue me in on this genius system!” Click. For a great resource on how to write headlines (and tweets) that use the right words and elicit a powerful response from readers, try CoSchedule’s free Headline Analyzer tool. Scroll down the page and you can even download a free swipe file of their best, most effective power words. Look out – you’ll be writing powerful headlines in no time! In addition to being ultra-specific, take the next step and make an ultra-specific promise with your tweets. You want people to click your link, but people want to know what’s in it for them. Come right out and tell ‘em! When you make a promise of benefits for the reader (and, of course, deliver), you’ll often get more than a click – you’ll get a fan for life. Check out the benefit-driven headline tweet from Buffer below. Fictional reader reaction: “I do love saving time and being productive when it comes to marketing. Not so crazy about spreadsheets, but if they’re premade and Buffer promises they will boost my productivity, I’m down.” Click. Sometimes you just have to tell people what to do. Now, understand I’m not saying to be pushy or bossy or obnoxious. Just simply tell people what you want them to do next. You’ll be amazed how often it works. So instead of putting out an enticing headline then just dangling a link afterward, tell people exactly what you want them to do. Ths may seem like a small difference, but it can have a big impact on your click-through rate. So there you have it – seven headline writing tips that translate into crafting awesome tweets that get clicked. As you may have noticed, most of these examples contain at least two of the tips. Challenge yourself. How many of these tips can you fit into one tweet? I’d love to see examples of your best tweets using these tips in the comments section below! David Boutin is an expert on Twitter. David is the content manager and wearer of many digital marketing hats at Social Quant in Tampa, Florida. When not staring at a computer screen, you can find David at the local parks playing basketball or staring at a TV screen watching Georgia Bulldogs football.